Simplified installation: easily installed inside outdoor lamp base with a series connection. 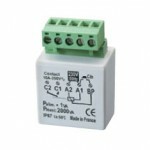 EASY: Easy to install in existing circuit – no neutral connection required. FLEXIBLE: Flashing interval can be adjusted from 0.2 to 25 seconds. The flasher can be controlled with a programming clock or a simple switch. Inrush current to the filament is limited during flashing to preserve bulb life. 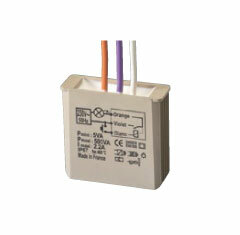 The flush-mounted module MTC500E is 100% waterproof for outdoor installation. Preserves the life of the light bulbs.